The smart choice for protecting your identity. Don't wait to become a victim of identity theft, get protected today. Get ID TheftSmart and let licensed investigators protect your identity, detect fraudulent activity, and restore your peace of mind in the event you fall victim to identity theft. Counseling includes one-on-one consultation & advocacy on your behalf. They will not only resolve known issues, but can also proactively identify and resolve previously unknown identity theft events. You do not have to be a victim of identity theft to benefit from counseling from one of Kroll’s Fraud Investigators. If you have a concern about your identity, you have access to assistance and consultation. Credit Monitoring will notify you of activity on your credit file. Alerts are provided on a daily basis from the reporting agency. Notification of no activity is delivered on a monthly basis. Credit Specialists are available 5am-5pm Pacific Standard Time (PST), Monday - Friday, excluding holidays. ID Integrity Scan is an early warning Online Fraud Detection service that performs regular searches of the Internet for your personal and financial information. If any suspicious activity is found, you will be immediately notified via email. Restoration includes confirming fraud, investigating, and identifying its starting point. Even if you have a credit monitoring service already in place, consider this: the Federal Trade Commission estimates that it will take 6 months, 200 hours, and $1500 to restore your identity once it has been stolen. Kroll's ID TheftSmart is the only place you will get a full-service restoration of your identity, saving you time, money, and headache. 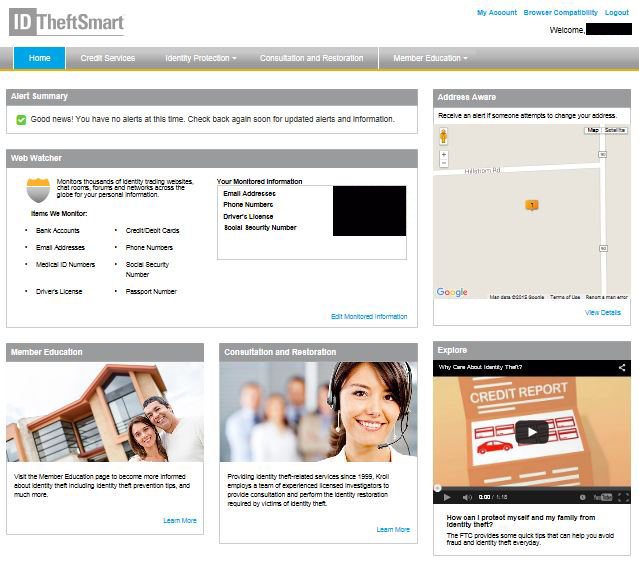 If you are enrolled in ID TheftSmart and have questions or concerns regarding being the victim of identity theft you are encouraged to call Kroll’s Investigation and Restoration Center at 1-866-825-4605 for further analysis. For administrative issues and password resets, please call 1-866-355-1044. Kroll’s investigators are available from 7:00AM to 7:00PM CST, Monday-Friday, excluding major holidays.